There it is a new, trustfully, clean and security based social network, funded by the people, for the people without ads. Sound like the perfect place to be. But there will be the same problems as always. It's not YOUR place, it is a place run by someone else, with their rules and yet still unclear measurements when a dividing or critical topic comes up. You know, Twitter was that place in the beginning. Even Facebook was, in the early days, kind of a light bringing savior for free speech. But for all of those, there came a moment when you discover that you have to play by the rules of the dominating communities at the beginning (and I read a press article where the team already explained that reports from people will then lead to your article being deleted and even your account probably removed), followed by governments, and then eyed by the press and all kind of activist groups from all directions. Then you have the same problem. What do you do? Uphold free speech at all cost? Giving away that right to play nice? Or just close? I don't believe in public social networks anymore, because they all fall under the same rules in the end. The only good thing to do is having your own place, your site where only you decide what you do or not with all consequences. THIS is freedom. 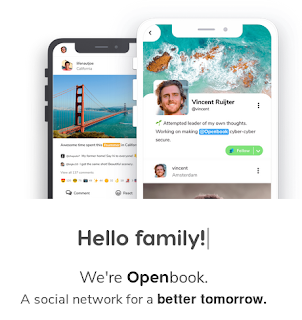 I already mentioned how to keep connected in a after-social network world, done by millions of people in some parts of the world already. Where no credible government have the right to snoop or even can snoop into: Your privacy. I wish Openbook all the good and success for their honorable intentions. It's just coming a bit too late in my opinion. The fight for free speech on a larger scale, has already been lost. And sadly, mostly the users are to blame for this.